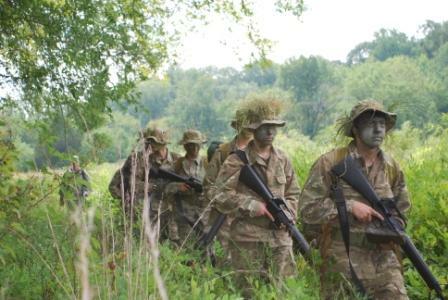 Approximately 145 high school aged cadets graduated from the 2010 Military Leadership Academy training at the National Guard Maneuver Training Center at Fort Pickett, located outside of Blackstone, Virginia. This year’s Academy experience was anything but ordinary. Cadets were given a tour of the USS George H.W Bush, the Navy’s newest and largest aircraft carrier, and observed infantry soldiers conducting live fire missions with .50 caliber machine guns. “The program was all and more than I ever expected…the Academy taught me not only about the military and leadership, but about myself as well. I learned invaluable things that I plan to carry with me for the rest of my life,” said Cadet Leland Hansen (Class 30). Students traveled from over 20 states and came as far as Seoul, Korea, and Paris, France, to attend both Academy sessions, taking place from 4 July – 17 July and 25 July – 07 August. Under the sounds of artillery and small arms fire, combined with the constant traffic of Humvees, mobile howitzers and formations of training soldiers, cadets learned firsthand what it takes to serve in our nation’s military. The Academy Instructor Staff hailed from some of the most professional and acclaimed ROTC units in the country, including the University of Maryland, Washington State University, Texas Christian University, and the North Dakota University. Also represented were two of our nation’s senior military academies, including the Texas A&M Corps of Cadets and the Virginia Military Institute. These future leaders of Soldiers and Marines drew from their training experience to create a program utilizing up-to-date tactics and techniques to reinforce the importance of teamwork and provide practical leadership training to cadets. In addition to tactical training, students had the privilege of interacting with servicemembers while touring various military installations local to Virginia. Hosted by Fort Eustis, Marine Corps Base Quantico, Langley Air Force Base, and Naval Station Norfolk, cadets received simulator time flying the Apache attack helicopter, witnessed a military working dog demonstration, and practiced operating the M16A2 service rifle. Cadets toured historic sites such as Jamestown, Yorktown and the monuments in Washington D.C.
To give back to those who made the ultimate sacrifice, Cadets conducted a community service project revitalizing the Veterans Cemetery in Amelia, VA.